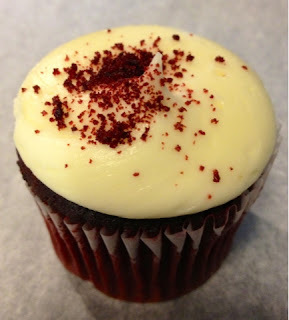 I caved in at the grocery store this past weekend and got some red velvet cupcakes...ooops! I normally don't eat sugar because it is toxic, but it's the holiday season, so I can't resist splurging a little bit. It turns out, the store-bought cupcakes weren't very good so I probably won't buy them again. 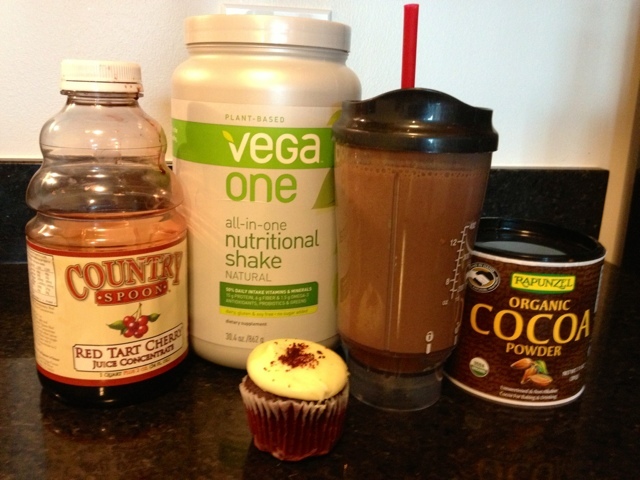 However, the red velvet cupcakes did inspire me to make a red velvet smoothie! The secret ingredient is Tart Cherry Juice Concentrate! You should have a bottle of this at home already because tart cherries are good for sleep since they are a natural source of melatonin (tart cherries don't necessarily help you fall asleep but the melatonin helps you stay asleep, so you can drink it any time of the day). I'm surprised that I haven't thought of putting tart cherry juice in my morning smoothie before. Tart cherries are also good for after working out since they reduce inflammation and therefore help your muscles repair. Also check out my other smoothie recipes: Vega One French Vanilla Smoothie and Vega One Pumpkin Smoothie. What's your weakness during the holidays?